A month from now, the Vegas Golden Knights will make history as the first major league franchise in the Big Four leagues to make its home in Sin City, at T-Mobile Arena. And while the Knights are Golden, so too is an anniversary for the league that celebrates this modern era: The legendary 1967 NHL expansion. While 1942 represents the start of the Original Six era in hockey, it is 1967 that truly brought the NHL into the realm of major sports leagues. That year, the NHL doubled in size by adding six expansion teams, the largest single expansion in sports history. With franchises in such far-flung United States locales as St. Louis, Minneapolis and Oakland — along with Pittsburgh, Philadelphia and Los Angeles — the NHL unleashed an explosion of sports arenas that would come to dot the North American landscape, right up to the gleaming, glitzy spectacle that is T-Mobile. With nicknames like the Igloo, the Pond, the Colisee, the Met, and the Checkerdome— some still standing, most lost to the wrecking ball of history — these expansion-era arenas weave together the story of the modern NHL. For its first 25 years, the NHL consisted of teams from Boston, New York, Chicago, Detroit, Toronto and Montreal. But in 1967, seeking a major TV deal and hoping to stave off the rival Western Hockey League for its talent, the NHL doubled in size to 12 teams by expanding by six. Four of the six teams (Philadelphia, Pittsburgh, St. Louis and Los Angeles) remain in their current cities today, although none in their original building. In Pennsylvania, the Igloo (formally, the Pittsburgh Civic Arena) and the Spectrum in Philadelphia (shown above) would become iconic sports venues, as would the Forum in Los Angeles, although more for its other occupant, the NBA’s Lakers. The St. Louis Blues reached the Stanley Cup Finals in each of their first three seasons — the last ending in a loss to the Boston Bruins on Bobby Orr’s famous flying OT goal. But the St. Louis Arena would earn its distinction in the team’s second decade with its re-naming as the Checkerdome from 1977-83 after the Blues and the arena were bought by Ralston Purina, famous for its checker-board logo. 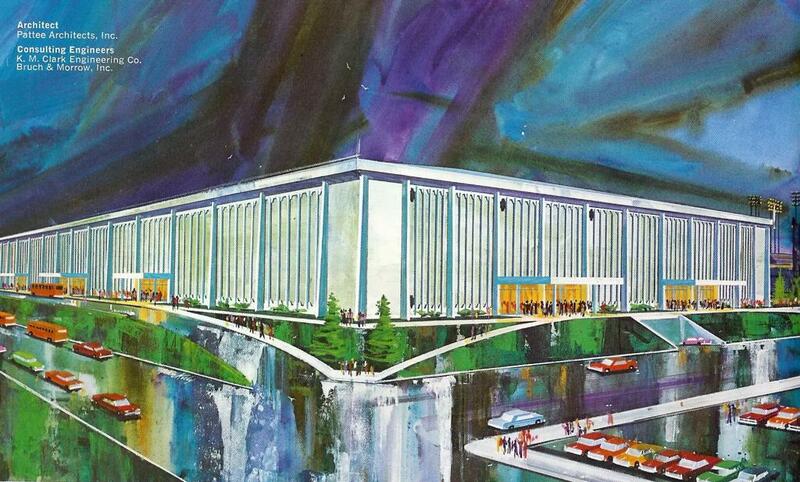 The most popular arena among the six new additions was the Metropolitan Sports Center (known simply as The Met or Met Center) in the Minneapolis suburb of Bloomington. The Met was a favorite of fans and players alike for its lighting, unique seat colors (owing as much to the North Stars’ colors of green and gold as much as the seat colors at the iconic Guthrie Theater), sight lines and fast, smooth ice. The Met, like the Oakland-Alameda County Coliseum Arena, which housed the California Golden Seals, lived in the shadow of a dual-purpose NFL/MLB stadium. Ironically, the Seals would leave Oakland after a decade, make a brief stop in Cleveland, then merge with the North Stars in Minneapolis in 1978. Then the North Stars ushered in the 1990s era of franchise re-location by becoming the Dallas Stars in 1993. The NHL added another six-pack of franchises in the early 1970s, this time by adding two teams every other year, in 1970, ’72 and ’74. The first duo to join were the Buffalo Sabres and Vancouver Canucks — the first Canadian expansion team in the modern era. Both teams would stay in their original arenas for their first quarter-century in the league. In Buffalo, it was The Aud, Buffalo Memorial Auditorium, which was originally built in 1940 and renovated and expanded in 1970 for the Sabres. Although the renovations increased hockey capacity from 10,449 to 15,360, the Aud remained known for its intimacy, becoming the last NHL arena in use in 1996 with an ice surface smaller than the league regulation 200×85 feet, barely outlasting the Boston Garden. The Sabres left the Aud after the 1995-96 season, and it was demolished in 2009. Only two arenas in NHL history have hosted teams that won four straight Stanley Cups. The Forum in Montreal was, of course, an Original Six icon. The other four-peat was born in expansion in 1972. The Nassau Veterans Memorial Coliseum opened as the league brought in the New York Islanders and the Atlanta Flames. The Flames, who played in The Omni, flamed out, moving to Calgary in 1980. That season, the Islanders gave rise to a dynasty that rivaled the greats in NHL history, winning four straight Cups and going 11-1 in Finals games held at the Nassau Coliseum. When the Islanders left in 2015 for Brooklyn, Nassau Coliseum was the second-oldest NHL arena in use, trailing only Madison Square Garden, which opened in 1968. Unless you lived in Kansas City, you probably had no idea that Kemper Arena hosted anything other than University of Kansas basketball. Joining Wilt Chamberlain, Danny and the Miracles and Paul Pierce were the Kansas City Scouts, an actual NHL team that existed for two seasons, from 1974-76. You might vaguely recall the non-baseball Colorado Rockies (1976-82) playing out of McNichols Sports Arena, but you definitely know what the Scouts ultimately became: The New Jersey Devils. The final team in the early 70s expansion was the Washington Capitals, who played at the Capital Centre until 1997. The Capital Centre was in many ways a revolutionary venue, the first indoor arena in sports history with skyboxes and also the first to install a video replay screen on the scoreboard that hovered over center ice. The NHL absorbed four franchises from the World Hockey Association in 1979, adding three Canadian cities (Edmonton, Quebec City and Winnipeg) along with an unlikely U.S. entry: Hartford, CT. And the Whalers would have arguably — perhaps fittingly — the most inauspicious debut into a major professional league. The Hartford Whalers, their name and logo having changed from their WHA iteration, became the New England Whalers and actually played their first NHL home game up Interstate 91 in Springfield, Mass. Two years earlier, on Jan. 18, 1978, only hours after a University of Connecticut men’s basketball game and in a major snowstorm, the Hartford Civic Center arena’s roof collapsed. The Civic Center was rebuilt and opened in Jan. 1980, but not in time for the start of their first NHL season. The Colisee de Quebec (now closed) also underwent renovations in 1980, as the Nordiques joined the NHL and the seating capacity increased to 15,750. The Winnipeg Jets would play at Winnipeg Arena (sadly, not still standing). But all three franchises would meet the same fate in the mid-1990s. First, the Nordiques moved to Colorado and became the Avalanche. The Jets became the Phoenix Coyotes in 1996. And the mighty Whale, having won just one playoff series in its 18 NHL seasons, left for North Carolina in 1997 to become the Hurricanes. The fourth expansion team from 1979 had a bit more success. Led by the Great One, Wayne Gretzky, the Northlands Coliseum became the most famous NHL arena in the mid- to late-1980s, as the Oilers won four Stanley Cups before Gretzky’s stunning trade to Los Angeles before the 1989 season. The Oilers were also under threat for relocation in the 1990s, but the franchise survived, and Northlands would become the third-oldest active NHL arena and the oldest not located in New York. Northlands was the first arena in Canada to have a scoreboard hang above center ice with an electronic message board and was the last NHL arena with the player benches located on the same side of the ice as TV cameras. It hosted the Oilers until 2016, when the team opened Rogers Place. The NHL went the entire decade of the 1980s frozen at 21 teams, and when it did expand again in 1991, it re-introduced one of the oldest arenas in American sports. So eager was the city of San Jose, CA, to procure an NHL expansion franchise for the 1991-92 season, they overlooked a minor detail — San Jose Arena was not properly configured to host on NHL team. The city was able to make the necessary adjustments, and the arena opened in 1993. But what about the two seasons before that? Where would San Jose put its Sharks on ice? Sharks, meet Cows. The Cow Palace, which opened in Daly City, Calif., on the outskirts of San Francisco, had actually tried to lure an expansion NHL franchise in the 1960s. That effort would result in the California Golden Seals being part of the original NHL expansion in 1967. But the Cow Palace was denied the team, instead going to nearby Oakland. But now, in 1991, and with the league and the city of San Jose in a tight spot, the Cow Palace finally fulfilled its promise, hosting the Sharks for two seasons. The addition of the Sharks marked a geographical sea change for a league hoping to increase its American audience and secure a major TV network deal. To that end, the league began populating teams in Southern and Western cities, re-locating Northeast and Canadian teams, while also creating expansion franchises in Florida, California and other warm-weather locales. In 1992, the NHL placed its first team in Florida, with the Tampa Bay Lightning, playing its games at Expo Hall, a 10,000-seat arena that once hosted indoor soccer and was not suitable for long-term use as an NHL venue. That led the Lightning to play three seasons at what is now Tropicana Field in St. Petersburg, but was then called The Thunderdome. The team finally settled on the Ice Palace (now Amalie Arena) back in Tampa, where it has been ever since. The league also returned to a former location in Canada, with the Senators taking root at the Ottawa Civic Centre. The next year, 1993, the league added the Florida Panthers, who played five seasons at Miami Arena before moving to nearby Sunrise in 1998 and an arena that could never keep its name straight: National Car Rental Center (1998-02), Office Depot Center (2002-05), BankAtlantic Center (2005-12) and BB&T Center (2012-present). The other 1993 expansion team, the Mighty Ducks of Anaheim, also played in an arena with more than one formal name (it was the Arrowhead Pond of Anaheim; it’s now the Honda Center), but you can just call it The Pond. The final four teams of the decade ended the expansion run until the Golden Knights in 2016. One of the four was a return engagement for Atlanta, with the Thrashers playing at Philips Arena from 1999-2011 before once again departing, this time landing a franchise back in Winnipeg. The other three expansion teams not only didn’t leave their original city, they haven’t left their original arenas. The Nashville Predators joined in 1998 at Nashville Arena, which has only changed its name to Bridgestone Arena. In 2000, the league added teams in Columbus, Ohio and back in Minneapolis/St. Paul. The Wild did not go to Bloomington like the North Stars, instead landing in St. Paul at the Xcel Energy Center. The Blue Jackets call Nationwide Arena home, a building perhaps best known for the rarest of NHL tragedies, when a 13-year-old girl was killed after being struck in the head by an errant puck that flew into the stands. Her death led the NHL to install mandatory safety netting above the glass behind and to the sides of both ends of the rink in all arenas.